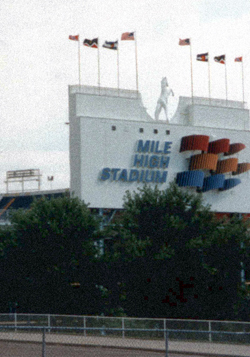 Mile High Stadium was born Bears Stadium in 1948, built for Denver's minor league baseball team. Originally a 17,000-seat grandstand, its additions over the decades brought it to a capacity of over 80,000. In 1960, it became home to the new Denver Broncos football team. In 1968, the city of Denver acquired the facility and renamed it Mile High Stadium: a multi-sport name worthy of a big-league city. Home to Bucky the Bronco, the Orange Crush, Barrel Man, the Comeback Kid and the Three Amigos, Mile High was among the loudest stadiums in the league. Fans overwhelmed opponents with "Rocky Mountain thunder," the roar of thousands of Broncos faithful stomping on metal floors. In half a century, the horseshoe hosted more than 300 football games and 3,000 baseball games, countless concerts and events, and the Colorado Rockies' first two seasons. Mile High Stadium closed in 2001, lending part of its name to its state-of-the-art successor. Saw many concerts there - Springsteen, Eagles, The Jackson's, Metallica, and more - remember the Denver Bears, Zephyrs, and the Rockies first few seasons. Even remember a few USFL games with the Denver Gold. My first time there though was 1983 - Broncos vs eagles - Jawarski versus John Elway (his rookie year) - they lost thst day but I was hooked! My folks had season tickets from 81-88 - I grew up on Mile High Thunder! Saw many games after that also! I live in Houston now - but now I get to represent that Old School Mile High down here! Badass shirt LoyalTee!! Thanks for brining back the original Mile High! I love the shirt but it shrank or I got fatter? Anyway, buy a bigger size and call it a day. Oh, the silk screening is not very heavy so it will get that worn in look really quick. What a great find - thanks to 5280 Magazine. Very high quality t-shirt vs. most t shirts, nice and soft, washes beautifully and is great for that loyal Broncos fan. I bought this for my husband since he's a Bronco fan and a Colorado native so he fondly remembers games at Mile High Stadium. He absolutely loves it and raves about how it fits. He's 6'0 with a very lean athletic build and the Large fits him perfectly. It's that soft, worn in tee-shirt feeling right when you put it on. He gets a lot of compliments on it and people are always asking where he got it. Love the retro mile high logo! Nicely done, Loyaltee! Buy 3 vintage Colorado T-shirts, get free shipping.